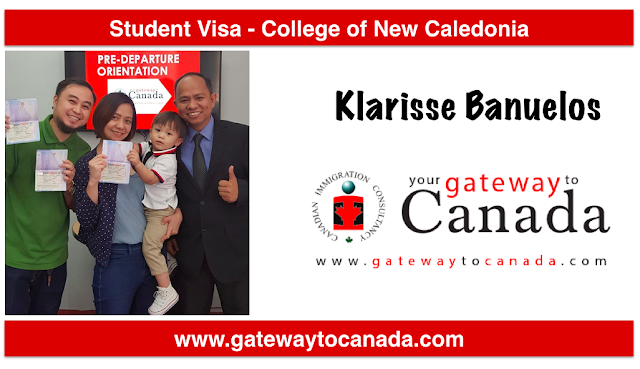 Ms. Klarisse Banuelos is going to College of New Caledonia - Gateway to Canada | Canada Immigration Consultancy! Another client is going to College of New Caledonia! Ms. Klarisse Banuelos and her family wants to immigrate to Canada. After presenting her the different pathways, they opted for the study visa pathway. As International Student, she will be allowed to work full-time for up to 20 hours per week. After her studies, she may be allowed to work full-time for up to 3 years. Her husband will be allowed to work full-time. With one year full-time and eligible work experience in Canada, they will have a great chance of getting their permanent resident status soon. College of New Caledonia is located at Prince George, British Columbia. The school does not require IELTS for applicants from the Philippines and the tuition is relative lower compared to most schools in the major cities. Gateway to Canada is one of the very few Authorized Agents of College of New Caledonia in the Philippines. Take our FREE Online Assessment and learn your options. You can bank on Canadian Immigration Consultancy's over 25 years of experience and become one of the thousands of clients we've already sent to Canada.